DARAPRIM, in combination with a sulfonamide, is the only medication approved by the FDA, for the treatment of Toxoplasmosis. DARAPRIM is not for everyone. Do not take DARAPRIM if you are allergic to pyrimethamine or have anemia due to folate deficiency. DARAPRIM and a sulfonamide work together to block folic acid synthesis in the parasite, which interferes with parasite reproduction in your body. DARAPRIM may cause folate deficiency which can lead to blood toxicity. Leucovorin may be prescribed to help counter this effect. At the first appearance of a skin rash you should stop use of DARAPRIM and seek medical attention immediately. Other symptoms that may be early indications of serious disorders include sore throat, paleness, and purple spots on skin or swollen tongue. DARAPRIM should be used during pregnancy only if the potential benefit justifies the potential risk to the fetus. The most common side effects that may occur with DARAPRIM include allergic reactions, blood disorders (including neutropenia or a low level of neutrophils, a white blood cell important to fight off infections), tongue changes, blood in the urine, heart rhythm disorders, anorexia and vomiting. ¹ "Neglected Parasitic Infections in the United States, Toxoplasmosis" Centers for Disease Control and Prevention, http://www.cdc.gov/parasites/resources/pdf/npi_toxoplasmosis.pdf. Accessed 27 June 2018. Your doctor will prescribe DARAPRIM through the DARAPRIM Direct Program using the DARAPRIM Direct Enrollment Form. You will need to sign the patient authorization section to access the financial assistance programs. 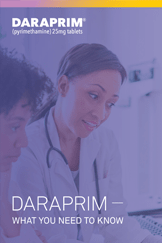 From there, a dedicated DARAPRIM Direct Care Coordinator will call you to assist with benefits and insurance verification, accessing financial assistance programs and arranging the delivery of your medication. If you have questions about your DARAPRIM prescription or the financial assistance programs available, call 1-877-258-2033, press 3. From there, a dedicated DARAPRIM Direct Care Coordinator will call to assist with benefits and insurance verification, accessing financial assistance programs and arranging the delivery of your medication. The DARAPRIM Direct Program was created to help you obtain quick and affordable access to DARAPRIM. From the moment you’re prescribed DARAPRIM, your dedicated Care Coordinator will help educate and support you through every step. 1Financial assistance programs are subject to terms and conditions and patient eligibility requirements. Restrictions, including where prohibited by law, may apply. Offers are subject to change or discontinuance without notice. Financial assistance programs are not insurance nor are they intended to be a substitute for insurance. *Limitations apply. Maximum benefit of up to $5,000 per month, with a $15,000 annual cap per calendar year. See full Copay Terms and Conditions below. Eligible commercially insured patients may pay as little as $10 on a DARAPRIM prescription, subject to a maximum benefit of up to $5,000 per month, with a $15,000 annual cap per calendar year. After the program maximum, you will be responsible for the difference. This offer is valid only for those with private or commercial insurance to cover a portion of medication costs for DARAPRIM and who have a valid prescription. This offer is not valid under Medicare, Medicaid, or any other federal or state program, for cash paying patients, or where a plan reimburses you for the entire cost of your prescription drug. This offer is not transferrable, and cannot be combined with any other coupon, discount, prescription saving card, free trial, or other offer. This offer is not health insurance and is only valid for patients in the 50 United States, Puerto Rico, Guam, and Virgin Islands. If you live in Massachusetts, card expires on the earlier of August 15, 2019, or the date an AB-rated generic equivalent is available. Void where prohibited or restricted. Additional terms and conditions apply. Vyera Pharmaceuticals reserves the right to modify or discontinue this offer at any time without notice. When you use this card, you are certifying that you understand the program rules, regulations and these Terms and Conditions, that you have responded truthfully to questions when activating the card, and that you will disclose and report the use of this offer as may be required by your insurer. It is illegal to, or offer to, sell, purchase, trade, counterfeit, duplicate, or reproduce the card. This virtual card must be presented to the pharmacist with a valid prescription to participate in this program. If you have any questions regarding your eligibility or benefits, or if you wish to discontinue your participation, call 1-877-258-2033, press 3 to speak with a DARAPRIM Direct Care Coordinator. DARAPRIM is a prescription medication that contains pyrimethamine for the treatment of toxoplasmosis when used with a sulfonamide (e.g., sulfadoxine). Taking DARAPRIM may result in allergic reactions that can be severe (such as Stevens-Johnson syndrome, toxic epidermal necrolysis, erythema multiforme, and anaphylaxis). Symptoms of an allergic reaction or the severe reactions may include: fever, body aches, facial or tongue swelling, skin pain, peeling of skin, blisters on your skin and mucous membranes, itching, rash, red itchy welts, wheezing, asthma symptoms, or dizziness or feeling faint. At the first appearance of a skin rash or any of the above symptoms, stop the medication and immediately seek medical attention. Other signs and symptoms of serious disorders may include sore throat, paleness, tongue changes, and purple skin color. Make sure to tell your healthcare provider if you have any heart conditions, especially if you experience irregular heartbeat. The most common side effects that may occur with DARAPRIM include allergic reactions (see above), blood disorders (including neutropenia or a low level of neutrophils, a white blood cell important to fight off infections), tongue changes, blood in the urine, heart rhythm disorders, anorexia, and vomiting. Tell your healthcare provider if you have any side effects while taking DARAPRIM. Notify your healthcare provider if you become pregnant or intend to become pregnant during therapy or if you are breast-feeding or intend to breast-feed an infant. Tell your healthcare provider if you have problems with your kidney or liver, decreased intestinal absorption problems, alcoholism, or any other medical conditions. Make sure you tell your healthcare provider about all of the prescription and non-prescription medications you take, including supplements, and especially sulfonamides or trimethoprim-sulfamethoxazole combination, proguanil (antimalarial medicine), zidovudine, or cytostatic agents (medicines that block cell division e.g., methotrexate, a medicine used for cancer or rheumatoid arthritis), phenytoin (a medicine to treat seizures), or lorazepam. Be sure to take your medicine as instructed. Do not exceed the recommended dosage. You may take DARAPRIM with or without food. However, taking DARAPRIM with food may minimize associated anorexia and vomiting. Keep out of the reach of infants and children: Deaths in pediatric patients have been reported after accidental ingestion. Note: The above information for patients being treated with DARAPRIM is intended to aid in the safe and effective use of this medication. It is not a disclosure of all possible adverse or intended effects. Please read the Accompanying Full Prescribing Information and talk to your healthcare provider for more information concerning your treatment. You are encouraged to report negative side effects of prescription drugs to the FDA. Visit www.fda.gov/medwatch or call 1-800-FDA-1088. To report SUSPECTED ADVERSE REACTIONS contact Vyera Pharmaceuticals, LLC at 1-877-258-2033. The Licensed Material is being used for illustrative purposes only.